From the time of its inception in America, the bicycle has frequently been linked to health issues, with proponents citing the restorative effects of a brisk vigorous ride, and critics warning of the dangers of physical over-exertion, amongst other things. 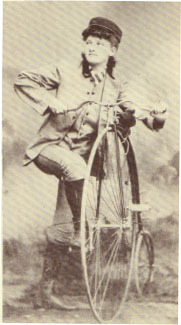 Indeed, the tone of the health debate follows a course that may have some correlation to the rise of the cycle itself; for while a great number of health officials were wary of the effects of cycling at the beginning of the 1890s, by 1896, at the craze's peak, doctor's increasingly spoke of cycling in rapt terms, with many claiming the bicycle capable of alleviating virtually any malady. One wonders if the general change in discourse did not come as a result of the health industry seeing just how smitten the public was with the bicycle. Whatever the reason, by the end of the 1890s the bicycle had been held up as both health menace #1 and the greatest tonic of all time. In the earlier days of the Golden Age, when cycling was quickly becoming democratized, nervous doctors found a health pitfall lurking around every consideration of the process. Many of these warnings sound patently ridiculous to the modern reader, as doctors cited the most indistinct ailments--things like "chronic disease" or an over worked nervous system to dissuade cyclists from taking to the road. Not all such warnings were so nebulous however, as doctors also frequently cited dehydration, exhaustion, and spine problems as possible bicycle related ailments. While the tendency to scoff at the wisdom of those of generations past is certainly great, we should assume that the warnings against taking to the roads were generally in the form of more level headed appeals. In "The Hidden Dangers of Cycling" an article published in the National Review in the mid 1890s, doctor A. Shadwell takes a less hysterical, although occasionally ill-informed, approach to enumerating the dangers of the bicycle. "Cycling season will be upon us soon, and there is every reason to suppose that more people that ever will take advantage of it," Shadwell writes.(p. 827) The article is not a condemnation of the bicycle, far from it, as Shadwell concedes that the bicycle "has established itself as a family institution"(p. 827), fit for all when used in moderation. Rather Shadwell, and, we shall assume, others in his position fear that "the craze" is blossoming with far few words spoken to the possible ill-effects of too much cycling. "Medical men have been kept in the dark", Shadwell warns, while "the successes are blazoned abroad, the failures are concealed."(p. 828). Shadwell, who purports to speak on behalf of many assenting colleagues, warns of the over-exertion that the bicycle may lure one into, for "the ease and rapidity of the locomotion tempt to over long rides by bringing some desirable objective within apparent reach."(p. 831) Thus "many are lured to attempt a task beyond their physical powers." (p. 832). While the above hypothesis may account for the ailments associated with physically overtaxing one's self, Shadwell points out that they do nothing to explain the "nervous troubles" that allegedly befell so many of our country's cyclists. Hilariously, Shadwell explains these disorders as stemming from the intense concentration the balancing act of riding a bicycle requires, noting, "Has anyone ever seen persons on bicycles talking and laughing and looking jolly? Never, I swear. Doubtless they can in a pinch, but in practice they don't."(p. 833). So, fearing a spill should they divert their attention from the task at hand for more than a moment, "apprehension works their senses up to a high pitch of tension." (p. 833). One must wonder if errors in the thinking of medical men like A. Shadwell who frequently fretted over the "hidden dangers" of cycling weren't the result of a lack of medical knowledge, but rather a poor understanding of the mechanics of the bicycle itself. Health concerns that didrely upon a poor understanding of the human condition were many of those that sought to discourage women from taking to their cycles. Although motives may have been more aligned with keeping women within their previously prescribed spheres than with preventing ailments in women, virtually all bicycle discourse of the day addresses the woman issue in one way or another. (Garvey, 74). Perhaps the most heated anti-cycling rhetoric came from those horrified by the fact that women were forced to straddle the seats of a cycle in a sexually provocative manner. Apparently, such straddling had never heretofore been an issue, as all true "ladies" who rode horses did so side-saddle. Apparently, the bicycle was increasingly breaking down familiar gender definitions, and many people, physicians among them, were quite worried. Not all the talk surrounding health was bad, however, as most doctors came to view the bicycle for what at its simplest it was"a means of exercise. So, while many overzealous doctors on opposite sides of the debate continued to promote the cycle as either cure-all or national scourge, as the decade progressed the furor was increasingly absent in their tones.